At the time of the Great Separation, the HIcksite branch retained the original meetinghouse and grounds in Hamorton, though the Orthodox members continued to meet there until 1830. At that time, they built a stone meetinghouse and established a burial ground in Parkersville on land purchased from John Parker. THe met at this new location until the turn of the century, when the meeting moved to Kennett Square, meeting in a number of locations there until a lot was purchased on the corner of Marshall and Cypress streets in Kennett Square. The meeting was laid down in 1931. 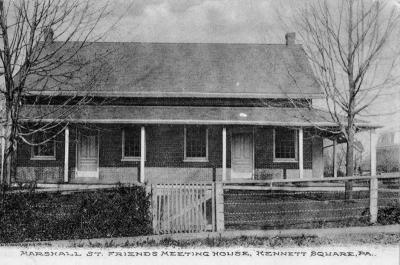 The Parkersville property was held by Kennett Monthly meeting. There is some confusion about the meeting regarding when it moved - the WPA Inventory shows a date of 1888, but other sources have shown as late as 1905.